Do you want a secure seal and strain relief for your cable? Then you are making the right choice with our cable glands from PFLITSCH. You get quality made in Germany at a fair price! A long history of success distinguishes PFLITSCH GmbH & Co. KG. A resident business enterprise of Hückeswagen, Germany was founded in 1919. With high quality cable glands and cable trunking solutions, PFLITSCH is known around the world as one of the leaders in cable management. PFLITSCH offers quality made in Germany. In this, a highly safe operating application and a long service life of its products are very important to the manufacturer. The cable glands of PFLITSCH blueglobe® have excellent strain relief, high density, large sealing areas and a first class rating. Benefiting in particular from these advantages, for example, are the railway, electrical, pharmaceutical and chemical industries. In our product range you can find in the category Enclosures selected cable glands, lock nuts and blanking plugs from the manufacturer PFLITSCH. You get, for example, cable glands such as the PFLITSCH blueglobe M25x1,5 - bg 225ms, locknuts such as the PFLITSCH M20x1,5 - GMM 220/7 PA and dummy plugs such as the PFLITSCH M32x1,5 - 7232/DR.. 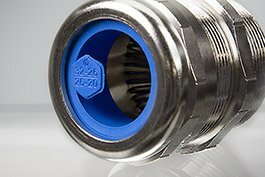 The blueglobe® cable glands are available in plastic or nickel plated brass and carry with them a high protection rating of IP68. With regard to the connection thread, you can choose from M8 to M85. Do not hesitate and provide for the secure sealing and strain relief of your cable with cable glands from PFLITSCH today. With us you get your orders quickly and at the best price! Do you still have questions? We will be happy to answer them by phone or chat.